Celebrate! The Birth of the Love Angel! We are introduced to Hanasaki Momoko as she is trying on her mother’s wedding dress. Her friends, Yuri and Hinagiku, stop in and remind her that they will be late for the soccer game which they are covering for their school newspaper. Momoko rushes to join them and they head off to the game, to see their beloved Yanagiba-san play. Meanwhile, unbeknownst to anyone, demons have made their appearance on the earth, determined to destroy any love energy that they find. After the game, they try to get onto the field to interview Yanagiba, but are stopped by Fuuma Yousuke, the team’s goalie. Unhappy at this, and still battling over who will win Yanagiba’s heart, the three walk home, but call a truce when they spot a crepe stand. After enjoying a snack, they start for home again but are stopped by Pluie, the demon sent to destroy the earth’s love and the Love Angels (Ai Tenshi) who protect it. He attacks Momoko, knocking out her friends, and tries to grab her ruby ring, a keepsake from her mother that seems to be far from ordinary. He is interrupted by Limone, a Guardian Angel that descends from the Heavens on a sparkling stairway to fight Pluie. Momoko rushes to aid her unconscious friends, but Pluie, seeking the advantage, has the demon Jamapi (literally, "little annoyance" or "obstacle") possess Yuri and Hinagiku, who will then try to get Momoko’s ruby ring for Pluie. Seeing this, Limone, who is still fighting Pluie, yells down to Momoko, telling her that she must take her other form—Wedding Peach. He gives her the Sacred Mirror and in it, Momoko sees the goddess of love, Aphrodite. Aphrodite tells her that she can transform when the Love waves reach their peak by saying "Wedding Beautiful Flower." 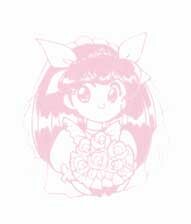 Momoko does and transforms into a bride—the Ai Tenshi, Wedding Peach. Her friends, possessed by Jamapi still go after her and Momoko uses her bouquet to drive out the demon with the attack "Lovely Operation Tempete." Jamapi, who cannot stand love waves, is driven out and her friends return to normal. Momoko passes out and when she comes to, no one except her remembers anything. Momoko, late for school stops in and buys lunch at a store on her way. She gets in just in time and sees her two friends hiding in wait, bearing homemade lunches. She asks who they're for, and is told they're for Yanagiba-sempai. Yanagiba, however, never gets the lunches intended for him--Fuuma shows up just in time to intercept them, taking the girls' lunches for himself. Later, at the noonhour soccer practice, Momoko sees Fuuma eating her only lunch (the one she'd bought on the way to school that she'd offered to Yanagiba-sempai). Furious (and starving), Momoko stomps down to the field to demand her lunch back. Unfortunately, she gets hit with a soccer ball and passes out. When she comes to, she's being carried by Fuuma to the nurse's office. Unhappy at this development, she struggles and shouts at them till they reach the office. However, the nurse isn't there so Yuri and Hinagiku leave Momoko in Fuuma's care until they find the nurse. As one might expect, they fight again, but Fuuma ends up tripping and landing on Momoko. After an awkward moment, they separate just in time for the nurse to return. Pluie, however, descends upon the school to attack Momoko. He manages to steal her ruby ring but is shocked when she transforms into her new form--Fighter Angel. Momoko, as it turns out, purchased the fake ring at the store where she bought her lunch that morning. Thus, Pluie is forced to retreat for the time being. Yuri and Hinagiku convince Momoko's father to let them help out when he photographs the wedding of an alumni from their school, a great soccer player, Susumu-san. As a special treat, the current soccer team will demonstrate at the reception, which would be why the girls are so eager to help. ^_- Unfortunately, as Momoko tries to take a picture of Yanagiba-sempai, Fuuma keeps getting in her way. Pluie, however, appears once again, drawn by the love waves emanating from the wedding chapel. He uses Jamapi to possess Susumu's bride, Mimiko, who turns on him and attacks the guests. Fuuma shields Momoko from the attack and she is able to escape. Meanwhile, all of the other couples have been affected and they all begin to argue. Momoko transforms and attacks the possessed Mimiko with 'Lovely Operation Tempete' and she regains her memory for a moment. But Jamapi fights back and Wedding Peach is forced to transform into Fighter Angel and use 'St. Mirror Bridal Flash' to drive him from the bride. Momoko and Hinagiku are invited over by Yuri to see her mother's wedding dress designs for her upcoming fashion show. They ooh and aah over the dresses and beg Yuri's mother to let them try them on. She refuses and Hinagiku calls her stingy and old. Needless to say, Yuri's mother gets very angry and kicks them all out, especially after Momoko accidentally knocks over all the dresses. Later that night, Jamapi tunes in on the love waves coming from Yuri's mother's dresses. He calls Pluie over and they tear apart the dresses while Yuri's mother, sleeps under Jamapi's spell. Yuri comes to check on her mother, who awakes to find all her designs destroyed. Still under Jamapi's influence, she blames Yuri and slaps her. Yuri, sobbing and still denying it is her fault, runs out of the room. The next day Momoko approaches Yanagiba and asks him if he'd like to be a model in a fashion show (obviously Yuri's mother's show). Once again, Fuuma interrupts them, allowing Yanagiba to escape, and inciting Momoko to rage. ^_- Hinagiku and Yuri come upon her, and guess what she had in mind. Yuri then interrupts them to inform them of what occurred last night. Later, when Hinagiku and Momoko walk Yuri home, the two yell at Yuri's parents for not trusting their daughter. Just as the family makes up, Pluie and Jamapi appear and Yuri's mother is possessed again. The blast of the attack knocks out Hinagiku and the others, but not Yuri, who follows Momoko, to the roof. There, she discovers that she is Angel Lily and she too transforms to join in the fight. Jamapi, in Yuri's mother's body, produces a giant pair of scissors and attacks them. The two perform 'Oira Naoshi' and transform into Fighter Angels, defeating Jamapi once more. The fashion show still goes on, with Yuri modeling her mother's very first wedding dress--her own.